An infertility diagnosis is often associated with a steep learning curve. There’s a lot of information and options to consider! For older women, there are also additional factors to think about. Fortunately, there’s a viable treatment available assisting fertility patients, particularly those aged 35 and over. In Vitro Fertilization (IVF) using egg donation helps infertile couples around the world realize their dream of having a baby. Here are three reasons why it’s becoming an increasingly popular fertility treatment. IVF with donor eggs success rates are 45 to 55% – a comforting statistic for couples struggling with egg quantity or quality, genetic diseases, or previous IVF failure. The high success rates come from the quality of donor eggs, with the most respected donor egg programs ensuring their donors are optimal in health and age. Donor eggs themselves are also screened to ensure only the best quality eggs are made available for transfer. When infertility is linked to age-related or genetic issues affecting poor egg quality or quantity, you may believe your options are severely limited. You might think surrogacy or adoption may be your only hope for having a child. While these are both effective options, it can be devastating for many women who want to experience pregnancy. Fortunately, IVF using donated eggs gives these women the opportunity to carry their child. A common concern using donor eggs is whether the child will look like the mother. Some couples choose donors who have similar physical features to them to increase these odds. However, research has found that mothers carrying donor eggs still influence the genetic expression of their children. Donor egg recipients don’t have to undergo the most medically intrusive part of the traditional IVF process – egg retrieval – a procedure carried out under general anesthesia. If you select fresh donor eggs, both your cycle and the donor’s menstrual cycle will need to be synced. You’ll be prescribed hormonal medication (such as birth control) to achieve this. 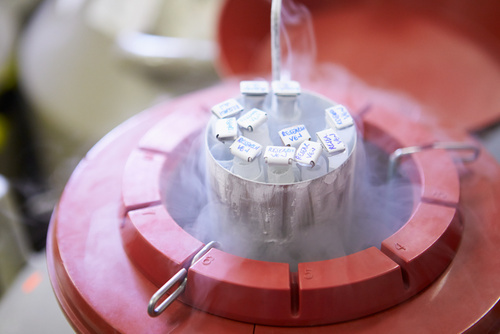 The most straightforward – and often cheaper – option is to choose frozen donor eggs. This doesn’t require syncing cycles, which means 1) you will know how many viable eggs are available beforehand and 2) you can plan your day of transfer. The process starts with choosing a donor egg program or network, then selecting a donor from their database. You’ll have access to key information about the donor, such as biological attributes, life accomplishments, and overall physical and mental health. Arrangements will be made to deliver your frozen egg lot – a group of five to eight of the donor’s most viable eggs – to your fertility clinic. Your fertility specialist will give you medication to thicken your uterine lining to increase the chance of achieving pregnancy. This medication may consist of injections and/or oral medication. Your uterine lining will be monitored to identify the best day for transfer. Once determined, your eggs will be thawed and fertilized with your partner’s sperm to become embryos. Prior to transfer, your fertility clinic will select 1-2 of the highest quality embryo or embryos. Ultrasound is used with a small catheter-like tube to insert the embryo(s) into the uterus. Most women report experiencing little to no discomfort, describing the process as similar to having a pap smear. It’s not unusual to feel a variety of emotions leading up to and during the process. These may range from elation to guilt and sadness, or even anger. It’s important to speak to your fertility specialist or medical professional if you are feeling overwhelmed or having difficulties coping with the experience. The two weeks following your transfer is often the most stressful time, as you’ll wait to see if the transfer worked. At the end of this waiting period, you’ll have a blood test to measure your human chorionic gonadotropin (hCG) levels – the pregnancy hormone. If all goes to plan, you’ll receive a positive result and your pregnancy will proceed like any other. If you require any additional guidance or resources, your fertility clinic will be there to advise on next steps and provide any support you need.